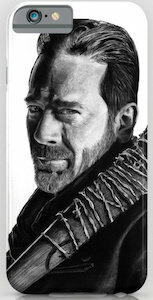 If your laptop can use a cool decal and you like The Walking Dead then you just need this Negan laptop decal. 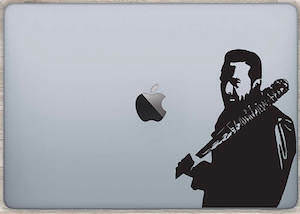 The decal shows Negan and his bat Lucille and it can dress up your Mac or other laptops. It will fit on most laptops as it fits all Mac’s and it comes in custom sizes to fit perfect on your computer. By sticking your Negan decal on your laptop you show sides and maybe other The Walking Dead fans won’t be so friendly to you any more because they like Daryl, Rick, and the gang. And when you are done with Negan then you can remove him without having to worry about left over glue and gunk. If you are a fan of The Walking Dead and need some baby clothing then you should check out this property of Negan bodysuit. The bodysuit is available in a bunch of colors including black and pink. On the infant snapsuit you can see two bats that make an x and yes that is Lucille but then twice and around the baseball bats it says “Property Of Negan” and that does not mean that Negan is the daddy of your baby or maybe it is as the baby daddy maybe part of the Negan crew and they are all called Negan. 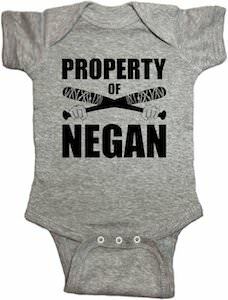 You can get this Negan bodysuit in sizes 0 – 24 months and it is made from 100% cotton. If you are a fan of The Walking Dead the needs a cool dress then you should check out this Negan t-shirt dress. 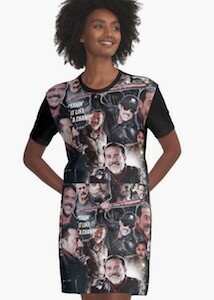 It’s a t-shirt style dress and it is a black women’s dress and besides the black, the front is covered in images of Negan and there are a lot of different images and yes, of course, Lucille is there too and even the text “Takin’ it like a champ”. You can get this The Walking Dead dress in women’s sizes XSmall – 2XL and if you would a dress is not your thing then it comes as a t-shirt and tank tops too. Now you can have a cool Negan earn what you take blanket from The Walking Dead. 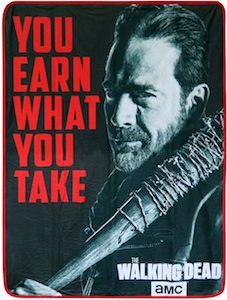 The black throw blanket has a red edge and on the blanket you can see Negan with his bat Lucille on his shoulder and it also says in big red letters “You Earn What You Take” and it has The Walking Dead logo too. The Walking Dead throw blanket is 45 x 60 inches and it is soft and fluffy and is made from 100% polyester. So now you can have a nice warm blanket to keep you warm when you are watching The Walking Dead and after that you can use it on your bed or maybe use it for a picnic in the park. If you watch The Walking Dead then you know that Negan is a name used by many people that are not friends of Rick and his group and if you want to be one of these Negan’s then this is the t-shirt for you. On the t-shirt, it says “I Am Negan” and Negan is in big white letters with a bat shadow in the background and some blood splatters. You can get this The Walking Dead t-shirt in style for both men and women and it is available in sizes Small – 6XL and it is available in a bunch of dark colors and is made from 100% Negan approved cotton. If you like Negan from The Walking Dead then this Negan costume t-shirt could be just perfect for you. 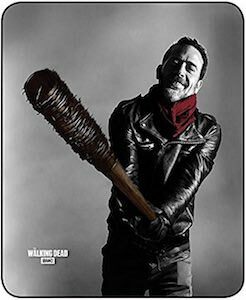 On the black t-shirt, you can find the black leather jacket that Negan wears and also a hand holding his bat Lucille. 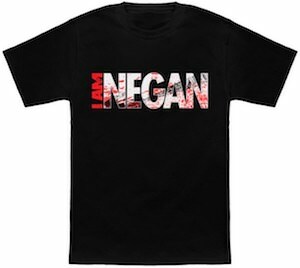 And if you wear the t-shirt you will be Negan. 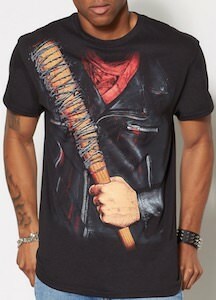 This officially licenced The Walking Dead t-shirt is just what you need to show the world what a mean badass you are. You can get this Negan costume t-shirt in unisex sizes Small – 2XL and that means there now can be a male and female Negan. Everyday or a costume occasion this The Walking Dead t-shirt is the one to own. 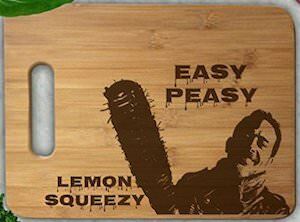 Do you want to add Negan to your The Walking Dead collection? If you do then you are in luck because now there is a figurine made from him. 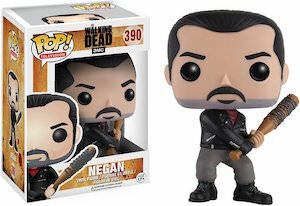 The figurine of Negan is part of the Pop! vinyl series made by Funko and this one has number 390 on the box. Negan is 3 3/4 inches tall and comes with his barbwire bat and his badly shaven face. And like all Pop! figurines this one also comes in his own windowed box so that you can keep him in mint condition if you prefer that over having Negan out and about.